It’s ridiculous really. 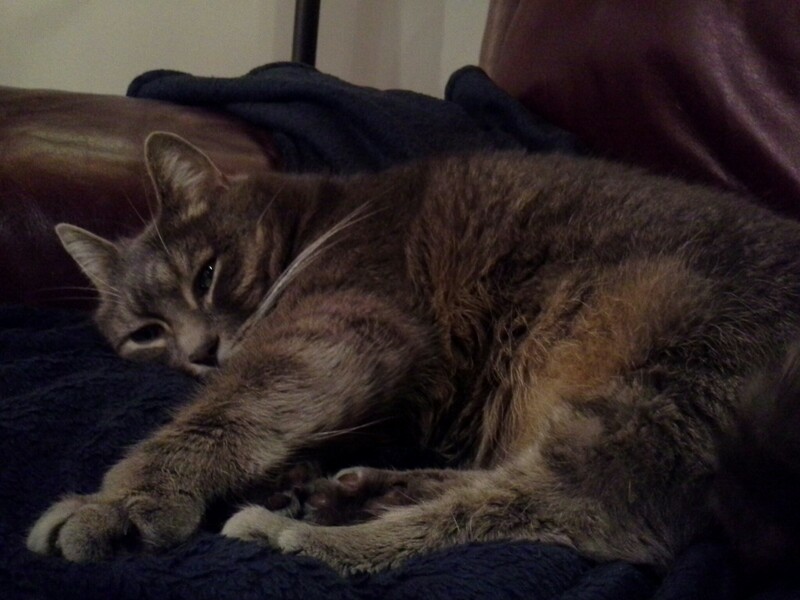 One of the plethora of names I have given to our furry mess of a cat is Pumpkin Pie. When I come home from the store or dashing down to the post office for our mail, I say “Pumpkin Pie, I’m home.” I rarely get more than a tail swish in my direction. When Mike was little, one of his neighbors referred to extinguishing the light in the Jack O’Lantern as “kicking out the pumpkin.” I’m unsure as to if she actually kicked her own pumpkin or if it was just Cambridge phrasing. We find ourselves once again in the position to hand out candy, but without any building neighbors who would supply us with the pumpkin so we don’t have to use our own. The easiest solution was to purchase a pumpkin and carve something other than a hole to make a lantern. But what? 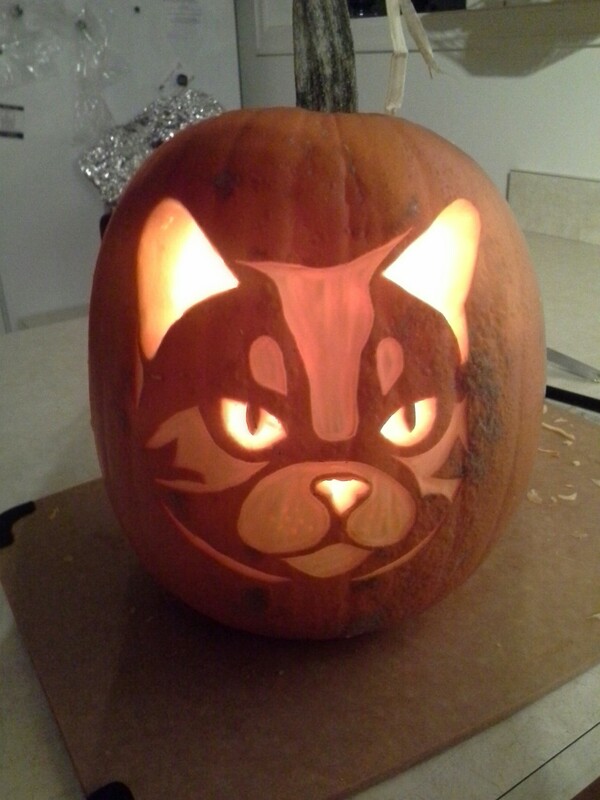 I’m not very skilled in the carving department, mostly due to my lack of patience. Mike, on the other hand, can draw some pretty decent artwork. Luckily, the web is full of inspiration. Alright, we got it from the Better Homes & Gardens website. “I got it hun,” Mike said, flashing the printout at me. 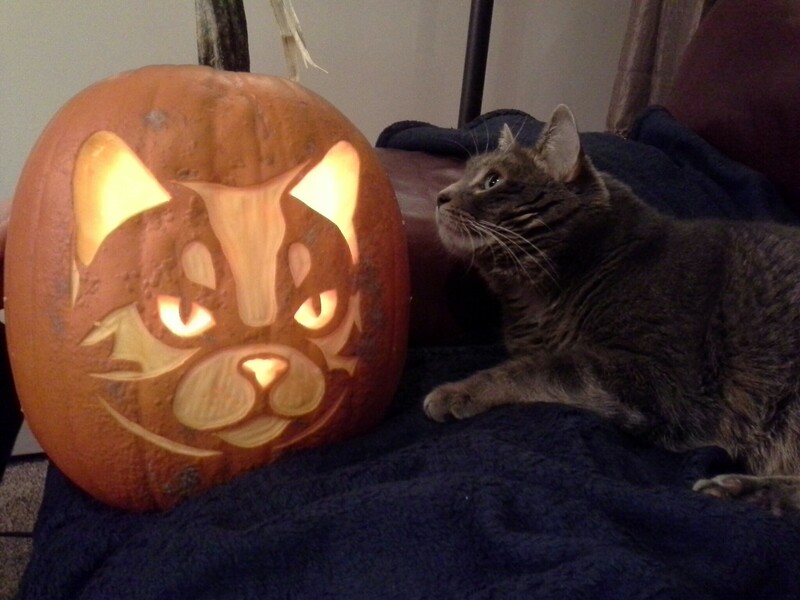 His brilliant idea was to put our pumpkin on the pumpkin, meaning a likeness of our feline will be the artwork on our pumpkin. Yep, we are those kind of crazy cat people. Using the wood carving tools from our holiday cards block printing tools, Mike knocked crafted a pretty darn good pumpkin! Granted, the inspiration for the project was interested in our creation for about 10 seconds — then he had to heed the call of his belly. That Pumpkin Pie. I just hope we finally get some trick or treaters and all the Super Heroes, ghosts, goblins, Harry Potters and Duck Dynasty boys stay home! Ha ha… looking good… ha ha … “yep, we are those kind of crazy cat people”. mom and I are hoping for trick or treat kids too!! I’m kind of in love…awesome job! 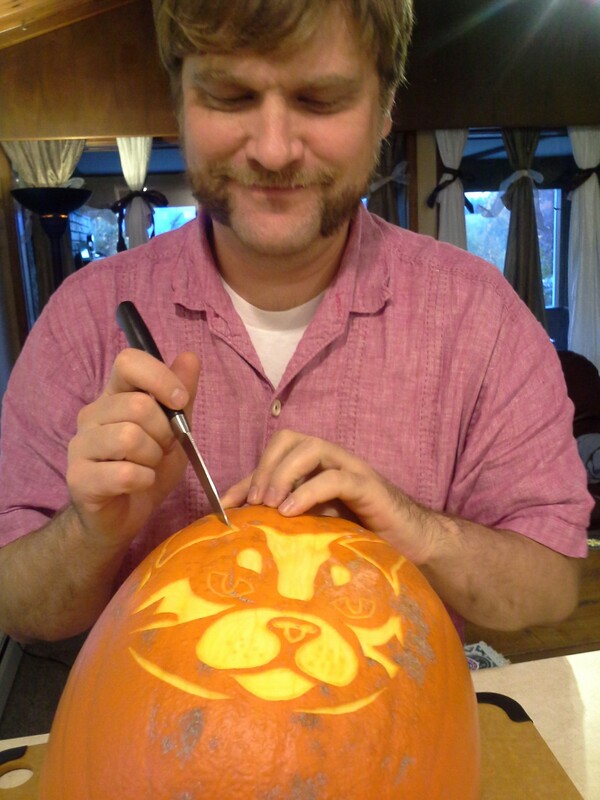 I haven’t carved pumpkins in a few years…since my kid’s were younger. This is so sophisticated…kudos!